You'll love the spacious layout, gorgeous windows, and high ceilings. Located in the Central Business District, you're steps from a streetcar stop, just a block away from The National WWII Museum, and a short walk from the Mississippi River. Modern kitchen and bathroom finishes will add to your experience during your stay in New Orleans. 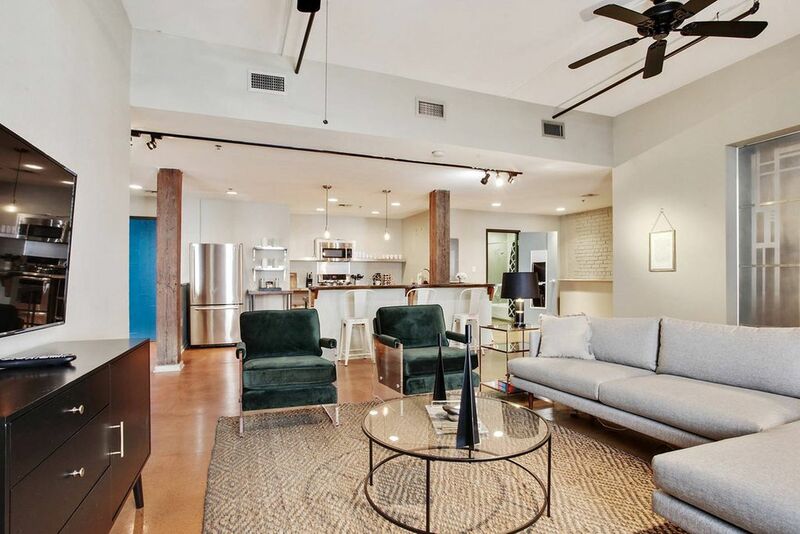 Perfect apartment for your NOLA getaway! We really enjoyed our stay in the Industrial Apt last week!! The apt. is in the warehouse district just down the street from the WWII museum. It is close to a streetcar stop, and a very walkable distance to Mothers and the Quarter, and around the corner from Cochon (excellent restaurant). The apt. itself is very cool (industrial / loft type place), and the beds were quite comfortable. There is some noise in the morning because it is in the warehouse district, and we heard a few trucks and garbage pickup. But overall, we really liked the apt. and its convenience, and would definitely stay there again! Thanks to the Domio team for all your help and info! This apartment is so cute! Very stylish and accommodating! I would definitely stay here again. Me, my husband and 3 of my girlfriends stayed here for my birthday. It's only a 6 minute walk to the Metro and has close by restaurants that we took advantage of. It was a great time. Only complaint is we had to leave! Amanda, thank you for the great review! We're so happy to hear you had a wonderful birthday celebration! We would love to host you again soon. Great accommodations, excellent location in the renovated warehouse district with easy access to restaurants, French Quarter and public transportation. Only downside was the availability of on street parking. With a little work, we were able to secure safe on street parking near the accommodations. My sister and I loved the space! It was a quick trip for us, but we so enjoyed the space and the location. We appreciated the boxed water and snacks. Plenty of towels. Comfortable beds. We hope to visit again and book here in the fall. Dawn, thanks for the great review! We can't wait to host you again soon! Great location in the Warehouse district, between the Garden District and French Quarter. Easy access also to Superdome and WWII museum (which is next door). Brad, thank you for the review! We're so glad you enjoyed your stay. The apartment was great. A short uber/Lyft ride away from Bourbon street. The parking was a struggle some days, but we were able to find parking. Having a key lock was great so we didn’t have to worry about sharing a key. Would definitely stay here again. Thanks for your kind words, Deann! We're so glad you enjoyed your stay with us in NOLA. We hope to host you again soon!